Outstanding Mario clone finally on 8-bit Ataris !! Rocks !! pr0be rulez !!!!!!!!!!!!!! Nice Graphics with nice effects. Smooth gameplay. Very promising. Fantastyczna grafika i muzyka. Cudownie ze sa Ludzie, ktorzy robia cos dla 8-bitowego Atari i to na tak wysokim poziomie. Oby Wam sie w zyciu dobrze dzialo :) Nice work! 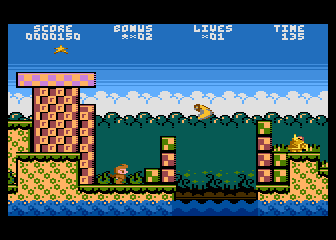 platform game my atari me beautiful! Best game on 800 lasf years... Wainting for full version. True. Guys, I want to see the full and FINAL (and cracked ;) version. Wow! I wish there was more A8 games looking as good as this. Please finish this game. the final product comes very soon. At the Glucholazy party, rumors came up that they release the final version after a complete code re-engineering very soon!! Why do the sprites flicker in the final but not the preview? Either way thumb up. not bad ;) nice graphics!